Sahar Albazar is the founder of the NGO/NPO club at the Kennedy School. She is an MPA graduate from Harvard Kennedy School of government, Class of 2015. 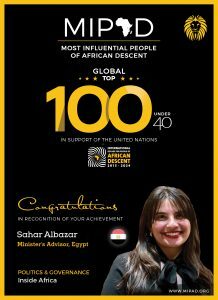 Before that, she was an Impact Assessment Consultant at the World Bank for Youth Employment Project in Egypt. She is currently the Advisor for the Minister of Social Solidarity Egypt. She was a Social Investment Advisor at British Petroleum Egypt. She is also the founder of Helwa Ya Balady, an NGO that focuses on developing “slum” areas and countering poverty in developing countries. Her NGO tackled a wide range of projects in Egypt, Somalia, Kenya, Syria and Libya. Her twelve-year experience in the development field culminated in leading an ongoing effort to establish a labor union for the informal sector in Egypt.